Regardless of one’s personal opinion about John D’Agata, his book–About a Mountain–is truly gripping. I couldn’t put it down; in my first reading session, (which lasted about an hour) I read approximately 100 pages. John D’Agata terms himself as a “lyric essayist” opposed to a “non-fiction writer.” He sees a difference and it’s up the reader to either put their qualms aside and enjoy or have a conniption and dismiss his book. To dismiss and disregard would be a shame. The book is focused on environment and suicide in Las Vegas. 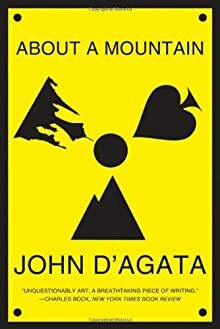 As D’Agata is helping his east-coast mother move to this strange city, he finds himself enthralled with the horrific topic of nuclear waste storage at Yucca Mountain. He writes about his own experiences and the opinions of local residents; D’Agata delves into facts and politics surrounding the proposed storage facility. At the same time, he is also interested in the extremely high suicide rate in Las Vegas (perhaps, the highest in the country). He focuses on a sixteen-year-old named, Levi Presley, who committed suicide by jumping from the Stratosphere Tower. Recently, I attended a talk which featured D’Agata. What first made him interested in all of this was when he was staying with his mother in Las Vegas and had volunteered with a suicide prevention hotline. One night, he had a hang up and the next morning, Levi’s death was all over the news. He convinced himself that it must have been Levi who phoned him. Although, it had not really been Levi, this was the impetus for penning About a Mountain. After reading this book, I can see how D’Agata refers to himself as a “lyric essayist.” He seamlessly moved between much different topics–environmental issues and suicide–and somehow has made them connect. The prose is clear and crisp and the book is long-lasting.